This article explains the concept of duration and provides useful examples that will help you with your CII investment exam revision. Bond prices and interest rates are inversely related. This means they move in opposite directions to each other. When interest rates rise, the price of bonds falls and vice versa. To help understand how these rate changes affect prices, a concept called ‘duration’ has been developed. Duration basically measures this relationship and approximates how much bond prices are likely to change when interest rates do. It’s a measure of the bond’s sensitivity to interest rate changes, or you could class it as the bond’s interest rate risk. The duration measure is in years and usually, the higher the duration of a bond (how far into the future you need to wait for repayment of your principal), the more volatile the bond price will be to changes in interest rates. As a general guide, for each 1% change in interest rates, the bond price will change approximately 1% in the opposite direction for every year of duration. For example, if a bond has duration of 3 years and interest rates increase by 1%, the bond price will decline approximately 3%. In our technology-enabled world of large amounts of information, you can conveniently find the quoted figures for duration on financial websites, however it’s good to know the formulas to understand what is going on underneath the bonnet and truly understand the bond/interest rate relationship. Frederick Macaulay developed the basic measure of duration in 1938. Macaulay Duration is the weighted average term to maturity of the cash flows from a bond. The weight of each cash flow is determined by dividing the present value of the cash flow by the price. 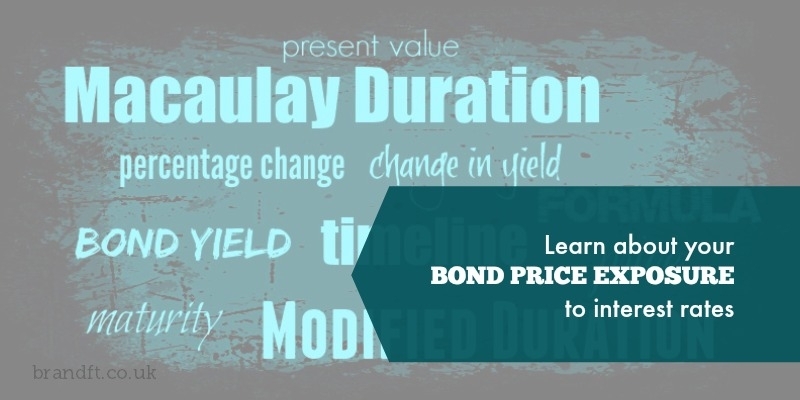 A bond pays an annual coupon of 9% and is redeemable at par in 3 years. Calculate the duration of the bond if interest rates are 8%. Whilst Macaulay duration would indicate which bonds are more sensitive to interest rate changes, it wouldn’t quantify how much the prices would move. The next step is to use modified duration. Firstly, duration is an approximate measure and tends to over-estimate the fall in a bond’s price, and under-estimate the rise in a bond’s price. This error can be calculated using convexity, which I won’t go into. It’s also important to understand that interest rates are only one of the factors affecting bond prices, however duration remains key when assessing the risk of your bond portfolio. If you’re studying for your CII R02 exam, and you’re wanting to secure a pass, grab our free taster to try out one of Brand Financial Training’s resources for yourself. Click the link to download the R02 mock paper taster now! Did you find these examples helpful? Please let us know in the comments! 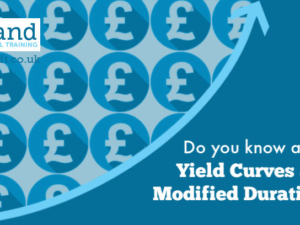 Do you know about Yield Curves and Modified Duration?